March 2016 – Mingei Film – Marty Gross Film Productions Inc. Examining footage from "The Art of the Potter." The Mingei Project is an endeavour by Marty Gross of Marty Gross Film Productions Inc. to restore and enhance rare and unedited film footage documenting the life of British artist-craftsman Bernard Leach and the origins of the Mingei (Folk Craft) Movement in Japan. See the list of films to be restored and digitally remastered for the Mingei Film Archive. The Mingei Film Archive Project proposes to enhance these early films for craftspeople, collectors, students and historians along with the general public. 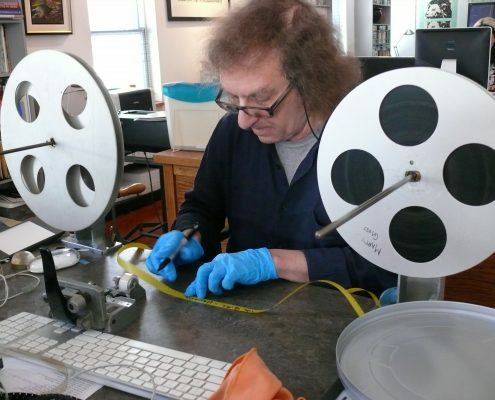 This project requires funds for completion, and Marty Gross is seeking to raise a total of $250,000 to preserve, assemble, and release these crucial film and audio archives. We accept donations! Visit here for more options on how you can help. Marty Gross Film Productions Inc. Copyright © 2016. Marty Gross Film Productions Inc. All rights reserved.